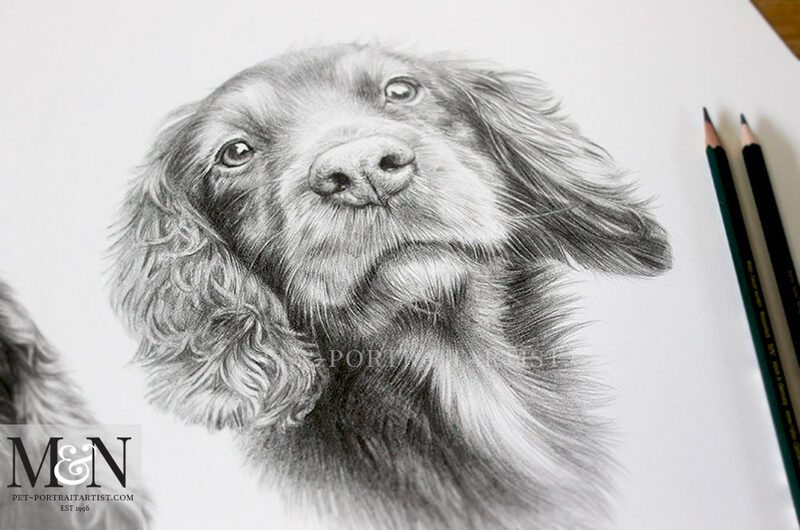 Welcome to my latest Spaniel pencil pet portraits! 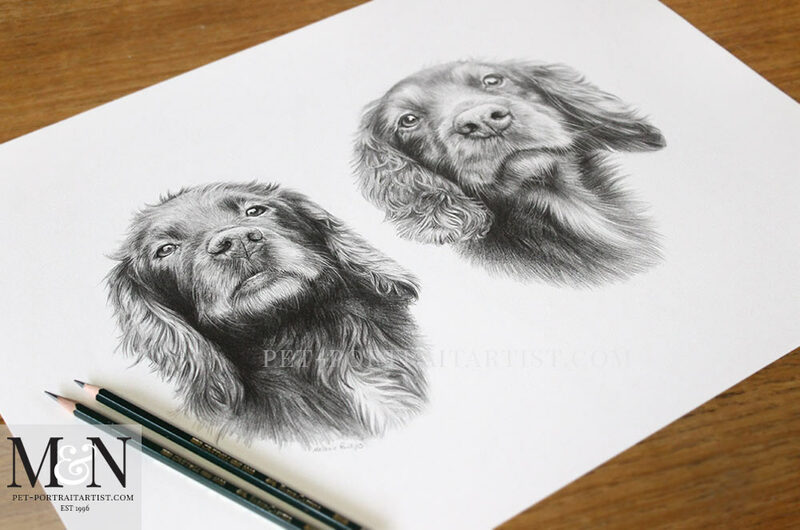 My drawing is of two beautiful spaniels called Jenny an Fern. I thoroughly enjoyed drawing them. The portrait was a retirement gift for Gail, purchased by Tara and Mark for all of Gail’s hard work over the years. 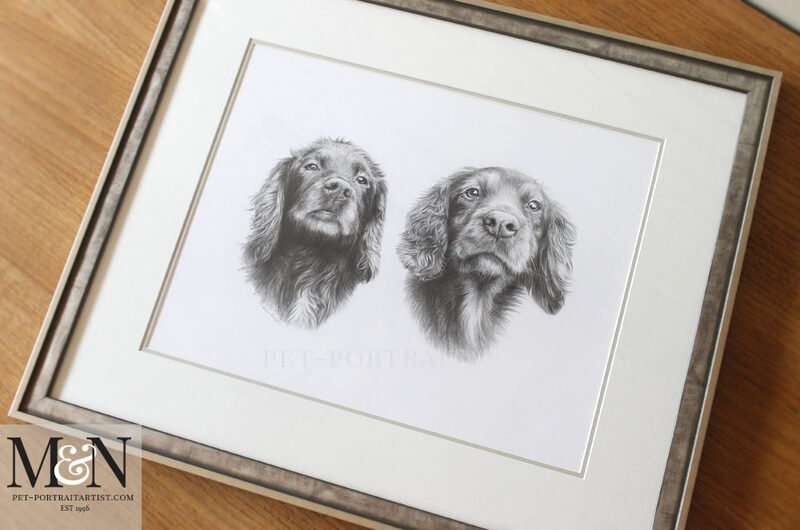 Gail emailed me lots of photos of her dogs when she received her Gift a Portrait voucher. 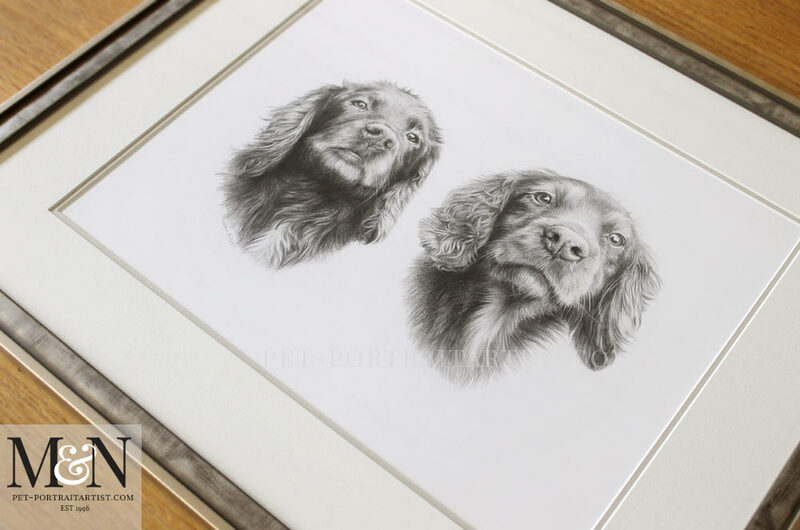 The pencil drawing is an 18 x 14 inches portrait, framed in our Sandringham frame. I have added a final scan of the portrait however you can scroll down for more information about the drawing and see lots more photos! Here are a few photos of the portrait on my plan chest with my pencils to show scale. I love taking photos of my portraits in this way. It gives a much more natural feel and I hope helps our readers really see what the portraits are like. 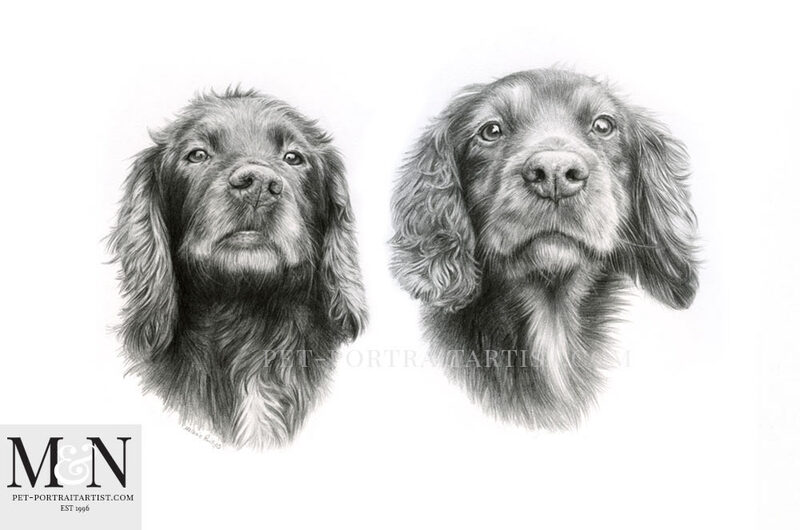 As you can see lots of detail went into drawing both dogs, especially their curly ears and soft muzzles. 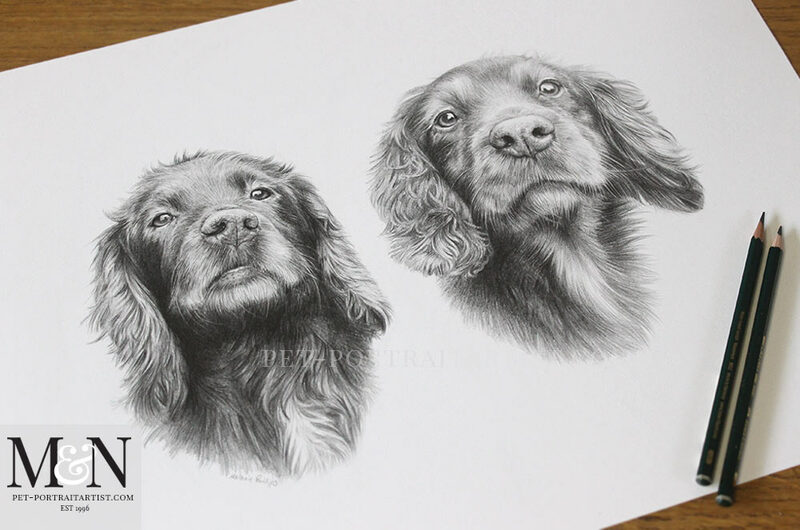 Spaniels are one of my favourite breeds to draw. 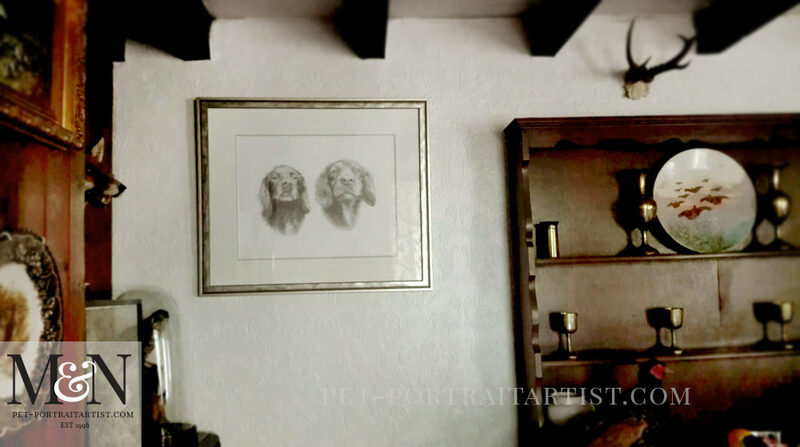 Spaniel Pencil Pet Portraits – Happy Clients! Gail emailed when she received the completed portrait and sent us this wonderful photo of the portrait displayed in their home. Received the picture yesterday all in tact. Both my husband and I are very very please with it. The picture looks amazing in the frame. Thank You again for everything, it has been well worth the wait. Gail received one of my Gift A portrait vouchers. It is a little more personal than just a general gift voucher that you can buy online. Every client who orders, receives a personalised and bespoke image designed by myself. This includes personalised text along with photos of the subject of the proposed portrait too. This means it is completely bespoke to the recipient and it can be printed on a home printer and slipped into a card. Alternatively it can be emailed direct or shown on a computer or tablet. There are so many options. To accompany the bespoke voucher image we also send a personalised letter and a flyer which show a full range of my work and happy customers. These can also be printed if required. So there are always plenty of things to see and read when the recipients receive their Gift a Portrait pack. If you would like to read more about the service, pop over to my website and visit my Gift a Portrait voucher page. The short video below shows my pencil drawing and frame in more detail. I took video mainly for the Sandringham Silver framing page on my website. I thought I would add it here for our readers to view as it shows the portrait well too. 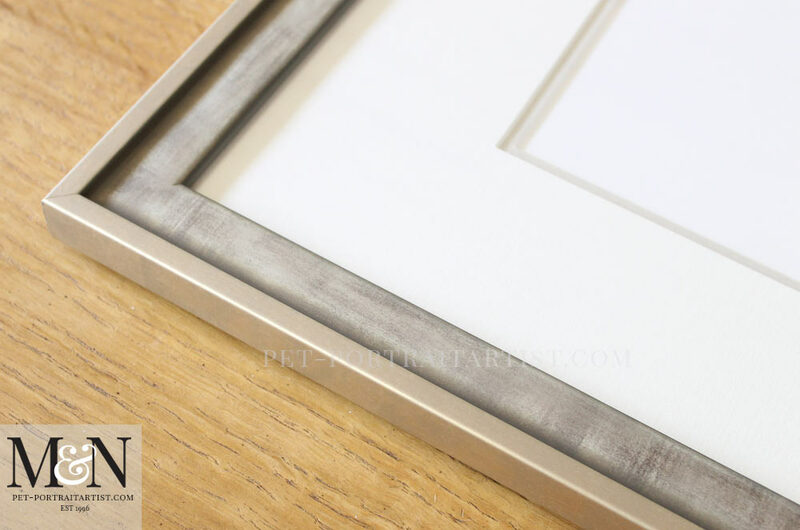 It is a really lovely frame and very popular with my clients. I have also added some close up photos below which I took just prior to packing the portrait up and sending it on its way to Gail. You can find these photos and other portraits framed in the Sandringham frame on my website too. 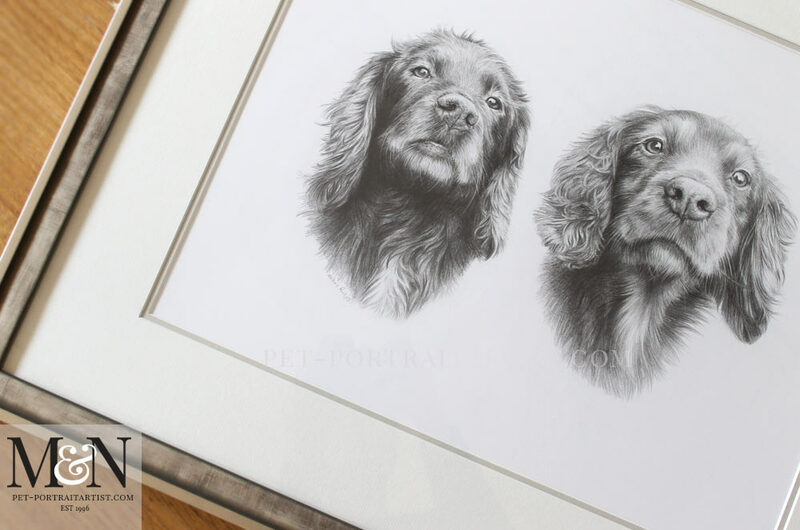 I hope that you have enjoyed viewing all of the photos and reading about my latest pencil pet portraits commission. If you would like me to draw your dog, please drop me a line at any time. Send me your photos and I will be thrilled to chat about your requirements.